Today Bookworm Bear is the Guest Reviewer at Mother Daughter and Son Book Reviews! We’re excited about reviewing one of our favorite books on this great blog. This is a parent and child book review – staring Mama Bear, and Son (age 11), and Daughter (age 9). 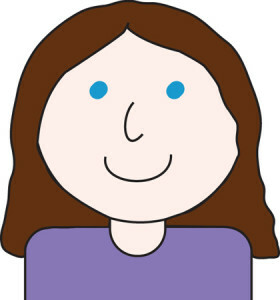 We had a lot of fun doing this together, and may do another mother-child post soon on Bookworm Bear. You can see the guest review on Mother Daughter Book Reviews by clicking here. 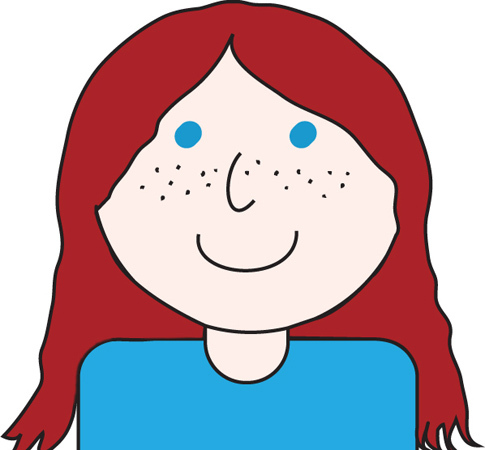 Igraine wakes up on her twelfth birthday to find a spider on her nose. She calls for her cat, Sisyphus, to help her because she is scared of spiders – so he helps by eating the spider. She gets up, puts on the chain mail shirt she found in the castle armory (and has been wearing ever since), and goes down to the moat to feed the water snakes while Sisyphus catches fish. Odd things begin to happen. Pink smoke is coming from the tower window of her parents’ magic workshop. Igraine and her parents receive a warning from Bertram, the horse master at nearby Darkrock Castle, that Osmund the Greedy is now in charge at Darkrock and wants to steal their singing books of magic. Shortly after that, her parents make a mistake when creating her birthday present and turn themselves into pigs. Igraine receives a suit of armor for her birthday. Igraine rides off to find giant’s hairs to turn her parents back into humans because they are pigs. Eventually she finds the giant Garleff, who lets her climb on top of his head to cut off some of his hairs. He also introduces her to the Sorrowful Knight who teaches her about the rules of Chivalry and goes home with her where they find the castle under attack. They sneak in through a secret passageway and help Igraine’s brother defend the castle. Igraine and the Sorrowful Knight distract Osmund’s army by having the Sorrowful Knight joust with the Spiky Knight, Osmund’s castellan, while Igraine’s parents work the magic spell to change back into humans. 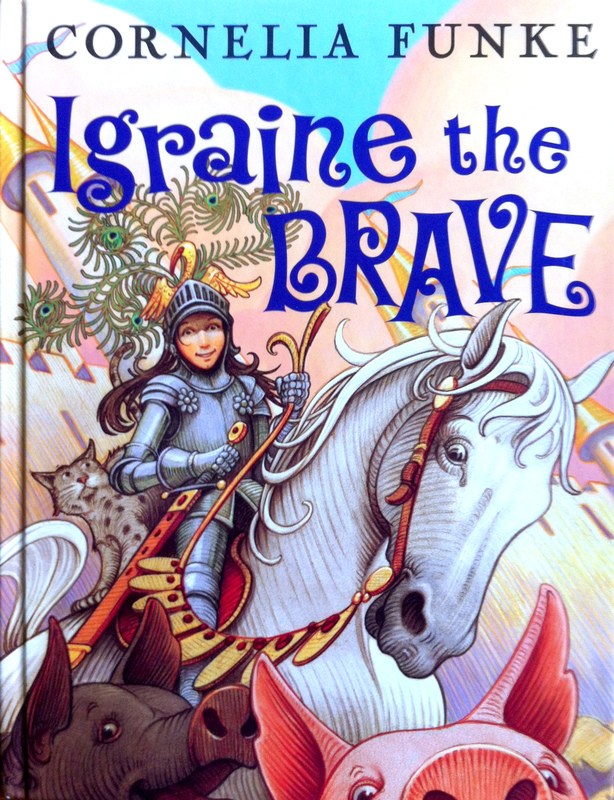 In the end, Igraine becomes the Sorrowful Knight’s squire, her parents successfully turn back into humans and send Osmund away without the singing books of magic. What is your favourite part of the story? My favourite part of the story is probably when Igraine goes off and finds the giant’s hairs. It’s really exciting because you don’t know if she’s going to be able to find the giant, if he’s moved, or if he’ll help her. Who do you think would like this book? People who like medieval things with knights and castles and things would like this book. I would recommend it to friends. 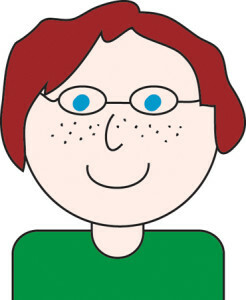 The main character is a girl named Igraine whose parents and older brother are magicians. A spell goes wrong and her parents are turned into pigs. Just after that happens, an evil magician named Osmund shows up at their castle to try to get her parent’s powerful singing books of magic. This is a very inconvenient time for this to happen, because they are out of the final ingredient in the potion needed to turn her parents back into people. After Osmund has gone, Igraine rides out to get the ingredient. On her way back, Igraine meets the Sorrowful Knight, who helps her get home. When they get there, they discover Osmund came back with an army to try to get the books. The Sorrowful Knight distracts Osmund by fighting his chief knight while the potion takes effect. After that, they all defeat Osmund. What is your favourite part of the story? I like all of it – it’s a great book. Who do you think would like this book? Someone who enjoys adventure stories and medieval times would like this book. Igraine, who is twelve, is part of a family of great magicians who live in Pimpernel Castle. Her brother, Albert, is learning to be a magician, too. But Igraine isn’t interested in magic. She wants to be a great knight. All is peaceful until Igraine’s parents have a magical mishap while putting the final touches on her birthday present – a magical suit of armor – and turn themselves into pigs. With her parents unable to do magic as pigs, and evil Osmund the Greedy preparing to attack Pimpernel Castle trying to capture the family’s magical singing books, Igraine sets off to get the missing ingredient for a spell to turn her parents back into themselves. Albert stays behind to defend the castle with the help of the magic books, their parents, and the castle’s magical defences (like gargoyles that eat cannonballs and arrows). Igraine’s adventures continue after she returns from her quest – bringing a sorrowful knight back with her – and involve a little magic, invisibility, distraction, bravery, and the code of chivalry. I love that Igraine is a strong female character. She wants to be a brave and honourable knight, and shows courage in doing whatever she can to defend her family and their home. She is likeable and flawed, too. She is afraid of spiders, and she can’t help but sneak up to her parents’ magic workshop to see if she can catch a glimpse of the surprise birthday present they are making for her. Although the book deals with an army besieging a castle, there are lighter elements in the story. No one actually gets hurt. If an attacking soldier falls into the moat, he is turned into a fish. Igraine’s brother, Albert, can melt a battering ram, and send arrows flying back to the archers with a snap of his fingers – but when it comes to food, he can conjure only dry biscuits and blue eggs. Igraine’s cat can speak (Igraine had sprinkled him with some of Albert’s magic powder), but doesn’t chose to do so all of the time. There are pen and ink illustrations scattered throughout the book – which fit well with the story. 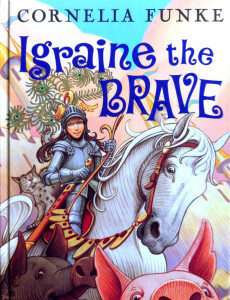 I enjoyed Igraine the Brave, and would recommend this book to children who like magic and adventure and who read in the 8-12 chapter book range. Special thanks to Mother Daughter & Son Book Reviews! Please stop by and check out this great blog. This sounds like a great book that would be really fun to read. I’m definitely adding this to my list on Goodreads! I’m looking forward to reading more reviews in the future, now that I’ve signed up for your email list. We love this book – just the right mix of adventure, magic, and humor. Thanks for signing up for emails! What is your favorite children’s book?